The classic game of 3-in-a-row, Tic Tac Toe, is a beloved game around the world. Intellectuapp will lead you to one of the best free TicTac Toe Android options for graphics and gameplay, so you can become reacquainted with a childhood favorite. 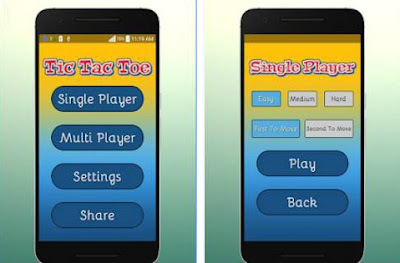 Tic Tac Toe – Multiplayer is an Android game and it is one of the best rated tic tac toe games on Google Play. It is all for a reason as this game is literally all you need in on Tic Tac Toe game. First of all, if you want to play a Tic Tac Toe game against the computer, you will have great fun as the computer is relatively hard to beat when the game mode is in “hard”. Additionally, the game offers you the ability to play against friends. There is nothing too complicated here, you just need to find a friend or a family member and try to outsmart him. Tic Tac Toe Multiplayer will enable you to simply see who is the better and the smartest one. Tic Tac Toe – Multiplayer is light, beautiful, smooth and the game modes against the computer are challenging. Great overall, really smooth tic tac toe experience. It’s free and available on Google Play.